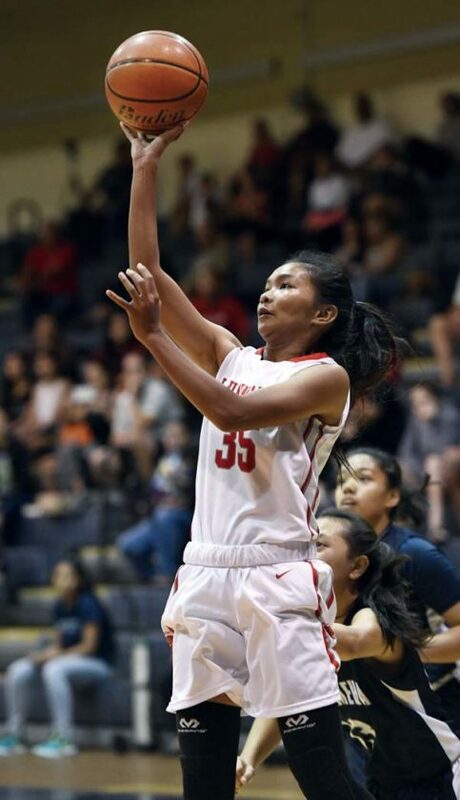 LAHAINA — The 142nd consecutive Maui Interscholastic League victory for the Lahainaluna High School girls basketball team did not come easily. 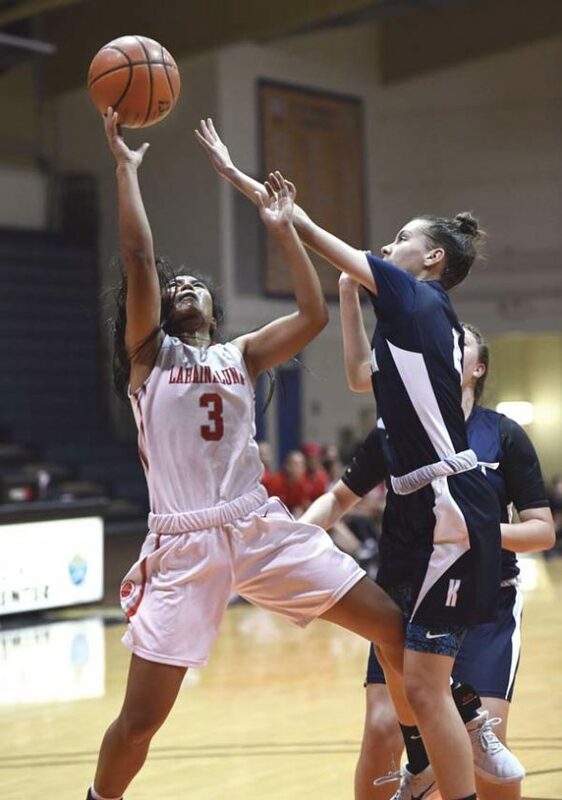 The Lunas had to battle to the final minutes for a 56-43 win over Kamehameha Maui on Saturday at the Lahaina Civic Center in a game the 13-time defending MIL champions led by just eight points late in the third quarter and by 10 twice late in the fourth. Braeanna Estabillo, the reigning MIL Division I Player of the Year, scored 25 points for the Lunas (8-0), including 10 in the final quarter. Kaylee Cam­bra’s 3-pointer with 3 minutes, 30 seconds to go in the third quarter capped a 7-0 run that brought the Warriors within 35-27. The Lunas led 40-29 going into the fourth. A rebound basket by Angel Pauole with 2:02 remaining cut Kamehameha’s deficit to 48-38, and a 3-pointer by Ashley Peralta with 59 seconds left made it 51-41. Estabillo made two of three free throws in the final minute to help seal the win. Peralta finished with 22 points and Cambra had 15. Fellow senior Kimani Fernandez-Roy, a two-time first-team MIL All-Star forward, did not play due to a sprained ankle — she said she expects to be back in about a week. Kamehameha (3-2) was coming off a 55-53 win over King Kekaulike on Wednesday in a game Fernandez-Roy also missed. Rachael Balagso scored 13 points for the Lunas, who were missing Erin Hookano due to what the team said were personal reasons. Back-to-back layups by Estabillo pushed the lead to 44-29 with 5:13 to play and prompted Aguirre to call timeout. Estabillo scored on a jumper from the free-throw line moments later to make it 46-29. Siena Poepoe 0, Kealia Sjostrand 2, Jamielee Felipe 0, Chasey Koomoa-Sidney 0, Brylee Carillo 0, Shaylisse Gregory 0, Tatiana Soon 0, Kayla Yamashita 0, Logan Spencer 0, Mikiala Sniffen 0, Kaylee Cambra 15, Ashley Taylor Peralta 22, Angel Pauole 4, Tatiana Martinez 0. Teani Buenconsejo 4, Sheilaika Agbayani 0, Rachael Balagso 13, Braeanna Estabillo 25, Keiko Aotaki 0, Kayjan Pahukoa 5, Maalaea Kaneaiakala 0, Erin Hookano 0, Kreyajan Pahukoa 0, Ashley Akamine 0, Tcleen Pahukoa 0, Tori Tihada 0, Teani Rickard 0, Susitina Namoa 9, Abigail Akamine 0. Lahainaluna at King Kekaulike, 5:30 p.m.
Baldwin at Kamehameha Maui, 5:30 p.m.
Lahainaluna at King Kekaulike, 7 p.m.
Baldwin at Kamehameha Maui, 7 p.m.